So you’re ready to try swimming for exercise, but maybe it’s been a while since you’ve been in the pool. A lot of people choose swimming because it’s such a great form of low-impact exercise. Whether you’re suffering from arthritis or joint pain, recovering from an injury, or you just want to try a new sport for weight loss and other health benefits, swimming is a great choice! The downside of swimming is that it’s not super intuitive if you’ve never had formal swimming lessons before, but the good news is that many gyms and aquatic clubs offer adult swimming lessons with a qualified instructor or swim coach to help you learn swimming. Find out what’s available in your area, because training with a professional is the safest way to learn how to swim. If you’re already pretty comfortable in the water but you need some help with your technique, then this guide to swimming for beginners is for you! With a little research and a lot of practice, you’ll be swimming like Michael Phelps in no time! For women, you can wear a swimsuit, a tankini, a two-piece, or a legsuit. Avoid embellished suits and bikinis. It doesn’t have to be a professional-quality competitive suit, just make sure it’s something that will stay on when you’re swimming hard. For men, your options are aquashorts, briefs, jammers, or shorts. Swimming shorts will create more drag in the water, while the other styles will make you more streamlined. Leave the baggy swim trunks at home. Whatever you choose, make sure it’s something you’re comfortable in both in and out of the water. If it’s not comfortable, you’ll be focusing on that rather than on your swimming form once you’re at the pool. Don’t forget it! There’s nothing worse than emerging for the pool soaking wet and realizing that you left your towel at home. Having at least two towels dedicated to swimming pool use that you change out and wash regularly will help you keep things hygienic. Optional, but highly recommended. Not only will it protect your hair from the damaging effects of chlorine, but it reduces your drag in the water so you can go faster. If you’re allergic to latex, make sure you check the label before purchasing one. Some swim caps contain latex, but there are a lot of alternative materials out there as well. Goggles are a must. 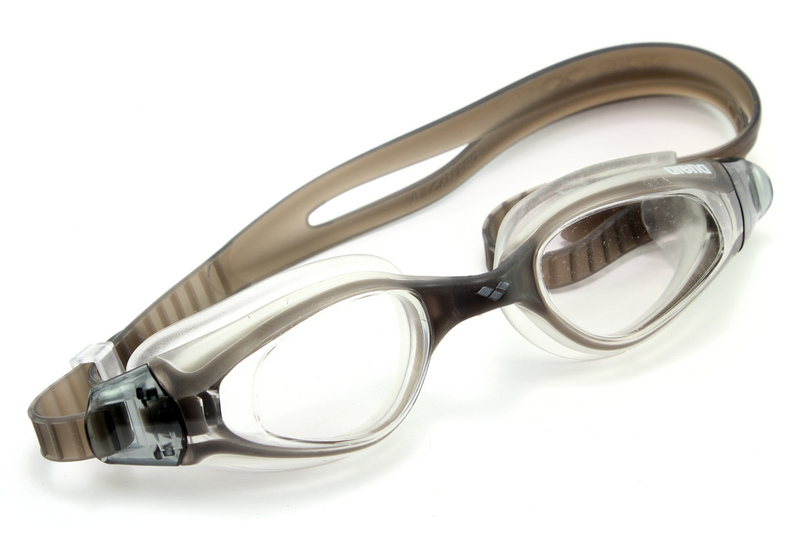 They protect your eyes from chlorine, and they let you see underwater so you don’t run into the end of the pool! Goggles come in a range of styles, including polarized, mirrored, and clear lenses, so what kind you get depends on your personal preference; just make sure that they create a good seal around your eyes so water doesn’t get in. 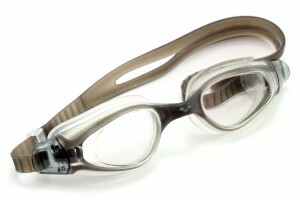 And this may seem obvious, but never swim with goggles that cover your nose or mouth. You need to breathe! Nose clip – This sits on the bridge of your nose and pinches your nostrils shut so water doesn’t get in your nose. Can be helpful for people with sinus problems. Water bottle – Yes, you can get dehydrated even when you’re in the water! Make sure you come prepared with a water bottle. Kickboard – This training tool can help you learn swimming by allowing you to practice kicking and build your leg strength. Sunscreen – If you’re swimming outside, make sure to find a good sunscreen that’s waterproof! 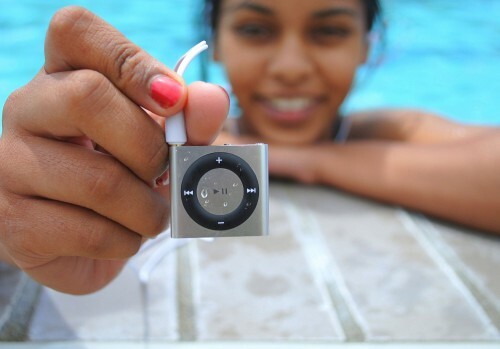 Waterproof iPod & Headphones – Completely optional, but if especially if you’re new to swimming, having your music or audiobooks with you in the pool can really help to pass the time and make your swim workouts fun! Never swim if you are taking medication which affects your mental state. Avoid swimming under the influence of alcohol as well. Never swim alone. Take a friend with you to the pool if you can, or at least make sure there is a life guard on duty wherever you are swimming. Only ever swim or dive at a level you feel comfortable with. Make sure you feel confident before swimming in the deep end or jumping off the high dive. Don’t run on the pool deck! Surfaces can be slippery, and you could fall. Keep a kickboard or other flotation device nearby if you’re a beginner. It’s okay to rely on these if you get tired easily. Ask your doctor about how much exercise you should be doing and if swimming is appropriate for you if you’re not sure. 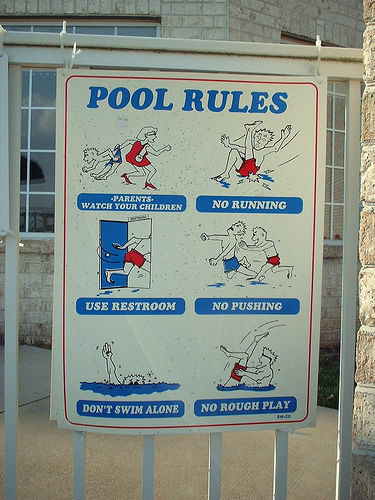 Do not jump or dive into shallow areas of the pool, as this can lead to injury. If you spot somebody else who looks like they’re in trouble, call for the lifeguard right away. 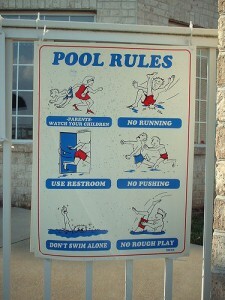 Make sure you familiarize yourself with the rules of your pool before you start swimming. Almost all pools ask that you shower before you enter the pool, so make sure you come prepared to rinse off. During times when the pool is open for lap swim, most facilities will designate certain lanes as “slow,” “medium,” and “fast.” No pressure here, pick whichever lane you feel most comfortable in, and don’t be afraid to hop out and change lanes mid-workout. Some pools also restrict which strokes are allowed in each lane, so keep an eye out for those signs too. 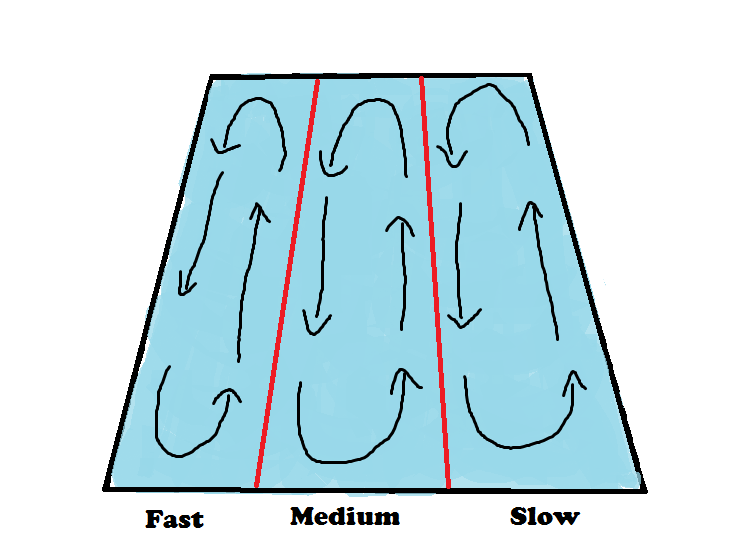 Swimming laps typically goes counterclockwise, so keep to the right of your lane. You can pass another swimmer if you’re sharing a lane with someone slower than you, as long as there’s space for you to pass them on the left. When you’re being passed, move the the far right of your lane and continue swimming. You may need to slow down or stop for a second to give the passing swimmer enough space to get by. Otherwise, don’t stop in the middle of the lane unless it’s an emergency! It’s important to take breaks when you need them, just try to do it at the end of the lane. Try to leave other swimmers as much space as possible. Generally, it’s good to make sure the person in front of you is at least a quarter of the way down the lane before you push off to begin your swim. Why are there flags above the pool? These flags are placed 5 meters from either end of the pool, and are designed to let backstrokers know when they’re approaching the pool wall. What is the pace clock for? The big clock that only has a second hand? That’s to help swimmers keep track of their speed. Generally, you start at the “top of the clock,” when the hand is on zero. You can also use it to help you time your rest breaks. Let’s say you’re an absolute beginner, and in the pool you feel like a fish out of water (pardon the joke). The first step is to get comfortable being in the water. Well, okay, you can’t actually breathe underwater, but you can blow bubbles out! Make sure your goggles are on. Practice inhaling through your mouth, putting your face in the water, and then exhaling slowly, just enough to keep water from entering your mouth. Some people find that wearing a nose plug helps them breathe out more easily underwater. Others like to breathe out from their nose and mouth at the same time. Experiment to find out what you’re the most comfortable with. Your exhale should be slow; about twice as long as your inhale. Start in the shallow end where you can easily stand with your head above water. Move you arms sideways and up and down. Feel how moving your arms causes your body to move in the water. Pushing down causes your body to move up. Moving your arms sideways causes your body to turn. Move into slightly deeper water where you can still stand with your head above water. Hold onto the wall and start bobbing up and down. Push off the pool floor with your feet. Breathe in when your head is above water, and breathe out when you’re underwater. Try doing this without holding on to the edge of the pool when you’re comfortable, but don’t go any deeper than where you can still stand with your head above water. Practice moving around in and under the water until you feel comfortable and relaxed. In order to float on the water, you need to keep your body flat and straight. Try to keep your hips on the same level as your shoulders, otherwise your body will tip and you won’t be able to float. You can practice this on land by balancing your body flat on a bed, bench, or chair. Try floating on your back first. Keep your body as straight as possible, with the back of your head between your shoulder blades. Move your arms to your side and wave your hands, palms down, away from your hips. This will help you float and move around. Once you feel comfortable floating, it’s time to grab your kickboard or a pool noodle and practice kicking! Hold the kickboard or noodle in front of you with your face out of the water (you can also hold on to the side of the pool), and practice kicking your legs softly in a fluttering motion. Keep your toes pointed and your legs as straight as possible. Kick from your hips, not your knees, and don’t kick too hard. This can actually slow you down instead of making you go faster! The next step is to practice breathing while you kick. Put your face down in the water to exhale, then lift your head out of the water to inhale. It’s probably a good idea to learn how to tread water before you jump in with any of the strokes below. You can find more information about how to tread water in this post here. Make sure your body isn’t too low in the water, but it shouldn’t be too high either. The best position is to have your lower back just below the surface. Keep your face down in the water and maintain a small flutter kick as you alternate pulling your arms. Your feet should be pointed and your legs should be straight. Your hands should enter the water flat, palm-first on each individual stroke. Keep your fingers closed to improve your speed, and make sure that your palms don’t point out. Your head needs to be at the correct level in order for you to breathe and swim efficiently. Your face should be in the water, but the back of your head should just be out of the water. To breathe, turn your head so your cheek is on the surface of the water. Alternate sides by breathing in every three strokes, and blow out your air during the two intermediate strokes when your face is in the water. It’s a lot like freestyle, but on your back! Perform the same kicking motion you use for freestyle. You can practice this on your back by holding a kickboard above your head. When you start using your arms, make sure that they aren’t too far away from your body. When they rise up out of the water, bring them in front of you. Keep your arms straight with your thumb pointed upwards, then twist your palm halfway through the air and enter the water again before pushing down toward your hips. Your hands should enter the water on the edge as opposed to entering flat. Your toes should remain pointed, continuing with a constant flutter kick. Make sure that your chin is not resting on your chest. Tilt your head back enough so that it is in line with your body. Your head should remain in a constant stable position, moving as little as possible as you look up at the ceiling. Breathing is easy with backstroke because your head is out of the water! Swim on your side and bring both arms into your chest. Push with the submerged arm and bring your other arm parallel to the surface of the water. In this stroke, continue to flutter kick with an extra burst of energy when you propel yourself forward with your arms. Keep your body as flat as possible to reduce drag. Your legs and arms should move simultaneously to keep a strong and steady stroke. As your hands stretch out in front of you and then back toward your chest, your head should rise so that your chin is level with the surface of the water. Keep your neck and shoulders relaxed. Your legs come up to your bottom with your feet turned out, and then kick back down to propel you like a frog. Keep your ankles strong and glide through the water as you kick with your head down under the water. Breathe after every outward sweep when your hands part and your head rises. Butterfly is the other most popular swimming stroke, but it is also the most difficult. Wait until you have mastered a few of the other strokes before attempting butterfly. Read more about the pros and cons of each swimming stroke. Avoid these common swimming mistakes. 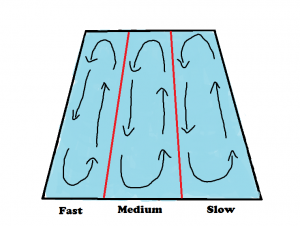 This post describes the five most common mistakes new swimmers make and how to correct them. Don’t be afraid to use swimming aids to support your body in the water. Kickboards, hand paddles, and pull buoys are great tools to use when practicing specific elements of each stroke. 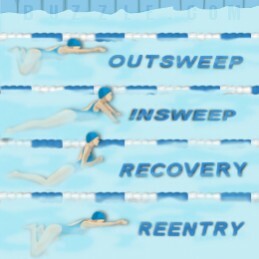 Break down complex motions to practice individual components of each stroke. For example, practice leg motions independently from arm motions. Or just practice one arm at a time. You can practice swimming on dry land. Lie down on the floor and practice specific elements of the swimming technique that you want to work on. Use visualization while you practice. That way you’ll be ready to go when you do hit the pool. If all of this sounds awkward to you, laugh it off and try something new. Swimming can be a lot of fun if you don’t take yourself too seriously. Basic laps are a super simple place to start once you’ve got the hang of a stroke or two. Try setting a time goal and count how many laps you can do in 20 minutes, 30 minutes, or 1 hour. If you keep practicing regularly, you’ll be able to do more laps each time! Notes: In this workout, concentrate on your breathing. The swimming drills will help you experiment with different breathing patterns. At this level you should always practice breathing the least amount of time first, and increase your breathing for subsequent laps. If you are comfortable with the drills, increase the 4 x 25 set changing breathing to 4 x 50. This will increase the total yardage of the workout by 100 yards. It will also have you swimming longer distances while you practice breathing. Please consult your doctor before beginning any type of training program. You can find that workout and more beginner’s intervals at this website. Just remember to take it easy and be patient with yourself when you are first starting out. If all else fails and swimming laps just isn’t your thing, try signing up for a water aerobics class. You still get to work out in the water, but instead of just swimming back and forth in the pool, you get to do fun routines to music! Of course, you can also listen to music while swimming laps if you have a waterproof iPod. And that wraps up our beginner’s guide to swimming! I hope that you learned something. Let us know what you think or if we forgot anything in the comments below, and happy swimming!